During the debate on Type Approval in the EU Parliament, Gay Mitchell MEP took the opportunity to remind the EU Commission that the case they put forward for imposing an NCT style test on motorcycles doesn’t stand up. Addressing the Commissioner directly, Gay Mitchell referred to the MAIDS study and noted that only about 1% of motorcycle accidents involved technical failure of the motorcycle, and went on to note the motorcycle road safety records of countries like the Netherlands which do not have RWT are amongst the safest. He further reminded the Commissioner that an NCT style test for motorcycles would impose an additional financial burden on citizens, and questioned the cost/benefit aspects. We in MAG Ireland take this opportunity to thank Gay Mitchell for highlighting the facts in a clear and unambiguous way. The EU Commission claims 8% of motorcycle accidents are the result of mechanical failures on the motorcycle (click here for source). To date they have refused to provide the evidence for this claim. Just 3 of the 921 accidents in the sample (0.3%) cited technical failure as the primary cause. Technical failure was a contributory factor in just 1.6% of all cases. 1.6% then is the worst case scenario. The Commission is claiming 8%. That means the Commission is making the situation out to be five times worse than the evidence shows it to be. Who stands to gain by exaggerating the problem like this? Why won’t the EU Commission tell the people where they got their 8% figure from? MAIDS is but one of several studies, though by far the best known and best researched, which show that the situation is nowhere near as bad as the Commission claims it to be. Even if it was, the RSA tell us that bikes makes up about 2% of all the vehicles on Irish roads. That means we are talking here about fixing a problem which affects about 2% of 2% of all vehicles – roughly 1 in every 2,500 vehicles on the roads of Ireland. Whilst MAG Ireland applauds the Commission’s aim to reduce fatalities on European roads, we believe in using accurate, factual figures based on publicly available data from reliable sources, and the EU Commission provides no such source for its 8% figure despite repeatedly using it to justify the inclusion of motorcycles in extended roadworthiness testing. This is simply unacceptable. At EU level, MAG Ireland has called on the Commission to justify its 8% claim or withdraw it. Here at home MAG Ireland has called for a full cost benefit analysis to be carried out on the proposals in the context of the Irish testing regime, something which has been provided for in section 4.2.9 of the National Motorcycle Safety Action Plan 2010-2014. Our view is that testing the nation’s 51,000+ registered motorcycles cannot be cost-effective, as specialist equipment and operative training would be required in each of the 46 test centres across the country. With an average of approximately three to four motorcycles being tested per centre per day, testing cannot be economically viable at current rates. 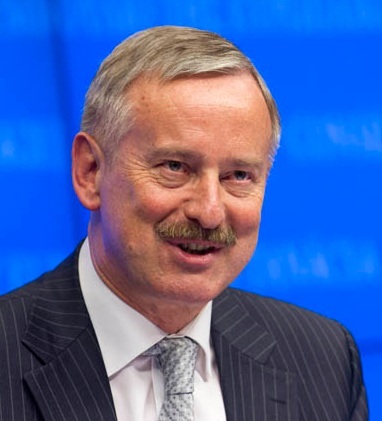 We applaud Gay Mitchell MEP for taking a balanced view on this issue and reminding the EU Commission that we as EU citizens will publicly hold them to account. MAG Ireland is in ongoing communication with Irish MEPs to bring the facts to their attention and is working with and through FEMA to tackle this issue at the EU level. 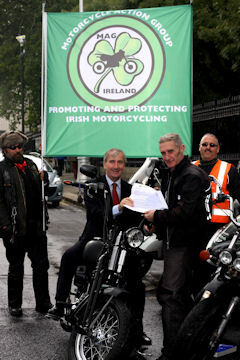 If you are concerned about the future of Irish motorcycling, why not join us?